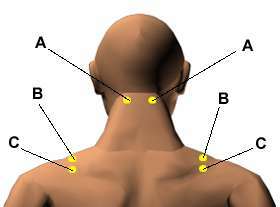 There are the acupressure points for relieving Shoulder Tension. Working on these points can help you get better quicker. You do not have to use all of these points. Using just one or two of them whenever you have a free hand can be effective. Location: Below the base of the skull, in the hollow between the two large vertical neck muscles, two to three inches apart depending on the size of the head. Benefits: Relieves arthritis in the shoulders and neck, headaches, and stiff neck. Caution: Pregnant women should press lightly on this point. Location: On the muscle at the highest point of the shoulder, one to two inches out from the side of the lower neck. Benefits: Relieves shoulder tension, nervousness, irritability, and fatigue. 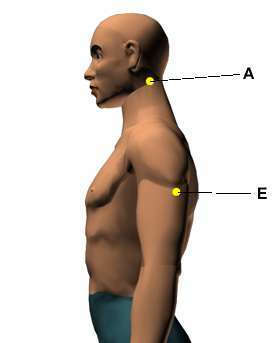 Location: On the shoulders, midway between the base of the neck and the outside of the shoulders, one-half inch below the top of the shoulders. Benefits: Relieves muscular tension, stiff necks, and shoulder pain. Location: On the outer surface of the upper arm one-third of the way down from the top of the shoulder to the elbow. Find a wiry muscle band by rubbing the fingers over the bone on the outside of the arm. Benefits: Relieves aching in the arm, shoulder tension, and stiff necks.